"As I stroll down the halls of Knox City High School today, it is a far cry from where I was in the Fall of 2010. My body was rejecting my kidney transplant and my immune system wiped out – as a result I was confined to home. I think back to the days of sitting in my room, where the silence echoed, my school work overwhelmed, and my friends seemed a million miles away. Life for me was the isolation of four walls of home or the hospital. It was not much of a life, but all that changed when the VGo or “Batybot” arrived. Its arrival was the result of Divine intervention, many educators dedication and love, and a community effort. The Divine intervention was the happenstance in which the salesman stopped by the Education Service Center just to show off the VGo, and see if there might be a place in education for it. Then the following day, the director of special educational services at Knox City High School contacted the center to see if there was a way to get me back in the classroom from the safety of my home. DIVINE intervention. Through many educators efforts and my community, the VGo arrived in time for school soon after the Christmas break of my freshman year. I was back in the classroom with a new lease on life. My morning routine was much like my brothers: wake up, get dressed, eat breakfast, and go to school - with the exception that I never left home. I opened the laptop, logged on and cruised down the hallways of Knox City High School with the “Batybot.” I saw my friends and teachers for the first time in almost a year. I was greeted with hugs, fellow students saying “I’ve missed you” and teachers saying “It’s time to get to class Lyndon.” It was incredible. I had a lifeline to the outside world. Soon the “Batybot” made its way to other places in the community - church, conferences, and seminars. Still, the best place it ever took me was to school. I used the VGo for three years, traveling up and down the hallways of KCHS. It was my connection to education, teachers and, best of all, my friends. 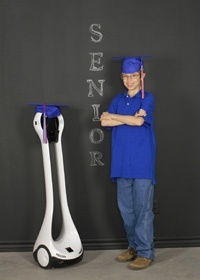 I will graduate with honors in a few short days thanks impart to the VGo. I believe education is more than just books and grades, it is connecting with people and developing skills that will last a lifetime, and VGo helped me do that. I will be attending Abilene Christian University in Fall of 2014 majoring in Journalism-Mass Communications. I continue to wait for a new kidney transplant." To learn more about Lyndon, click here. We at VGo are proud to call Lyndon 'one of our kids' and wish him all the success in the world. With his can-do attitude, we know he will go far in this world! Congratulations on your graduation, Lyndon!